Design and develop deployment strategies to provision master provisioning device in order to orchestrate the deployment of the system environment deployed in the field. Develop and deliver appropriate configuration and deployment scripts and objects primarily developed in Powershell V5.1, using desired state configuration in a push model. Automate process to continuously build and deploy the device on demand and on schedule. Develop and deploy just in time devices daily for continuous improvement and test. Technical Leader for design and implementation of Continuous Development / Improvement and Testing Services for next generation of provisioning services for War-fighter Information Network - Technical (WIN-T) program, using state of the art .NET tools and processes. Delivered extensive PowerShell based scripting system to deploy application delivery services using Citrix XENServer and Citrix Receiver on a VMware Virtual infrastructure. Updated automatic image finalization tasks from vbscript to PowerShell. Implemented PowerShell scripting and custom cmdlets to support new deployment strategies. Developed and executed initial migration strategy (vSphere/ESXi 5.1 to 6.0). Developed PowerShell based GUI wrapper to support legacy Perl scripting as interim solution. Mentored and supported new staff and student interns. Conducted initial testing of vSphere 6.0, and ESXi 6 upgrades. Developed package management /deployment services using Nu-Get and Chocolatey package managers with Desired State Configuration implementation. Responsible for all technology services and programs for school district. Stabilized obsolete operations, and developed best practices for technology support using state of the art tools and processes. Virtualized all back office services using VMware. Migrated from legacy Windows 2000 environment. Conducted quality process reviews to improve service delivery and improved district workflow. Migrated district from obsolete and unreliable MS Exchange system to Google Apps for Education (GAFE), while keeping old system in place, and successfully migrated all legacy and archived data, email and staff/student records. Developed and deployed new VOIP hosted service, bringing communications to every teaching area in the district. Successfully piloted a 1:1 implementation using Chromebooks for Advanced Placement (AP) HS Classes, and 1:1 program to Grade 6 classes for SY13-14. (130 users). Implemented new wireless infrastructure in all buildings (Aerohive). Established Pilot program for tablet devices in student services programs and in primary grades. Migrated staff and students from a lab / desktop environment to VDI, ‘Bring your own Device’ strategy using terminal services, VDI, and SAAS Solutions. Ambient provides "Smart Grid" solutions for the Power Distribution Industry. Migrated 2500 test cases from older less-reliable testing tool to new framework. Implemented Test framework using Ranorex - C# based solution. Developed data driven tests to support new infrastructure. Worked to integrate automated testing through scripts and utilities to force auto install and auto testing on demand. Unidesk provides desktop layering technology that virtualizes and manages the three layers that comprise VDI - OS Layer, User Layer and Application Layer. Member of an Agile/Scrum team responsible for development of Customer-facing Silverlight application to monitor and manage Virtual Desktop Management solution. 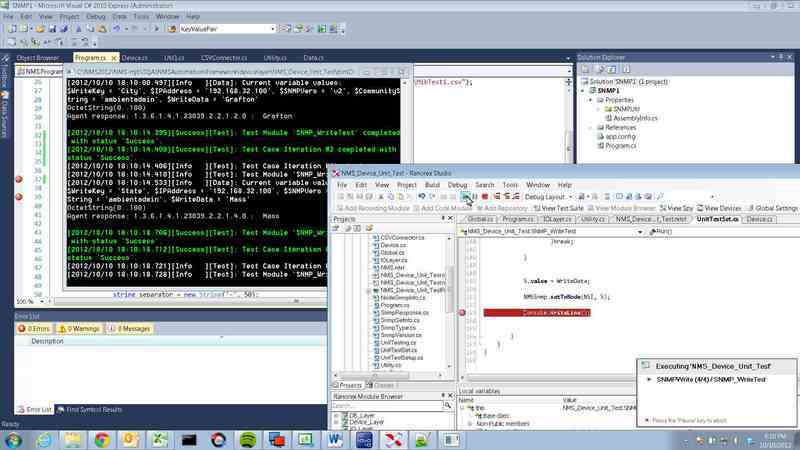 Developed test harness test suites and utilities to exercise and regression test GUI features of product, covering over 90% of the feature set. Provided hands-on training to support team members in implementation roll out of solution. Responsible for integration of third party products into Unidesk solution. such as VMWare View. Integration saved time in deployment of testing operations, and minimized duplication. Assisted in the re-factoring and expansion of internal Test frameworks developed in Python to support new features, and to minimize testing gaps. Investigated and developed PowerCLI scripts to support testing and management of VMWare infrastructure. Initiated, Developed and executed a successful Proof of Concept to virtualize over 140 desktop and servers for testing, that became part of the standard approach for testing. Re-factored existing Silktest infrastructure to support new features and new technologies. Wrote all functions, methods, declarations, scripts and plans to test product. Built a Silktest-Driven Installation system using Null Soft Installation System (NSIS) and Silktest - Completely automated daily builds including database updates, smoke and functional testing. Worked with Junior members to adapt new functionality testing into Data driven testing methodology. Developed framework to support new custom WinForms and WPF application in .NET 3.5 using custom Silktest solution and plugins to support object recognition of custom controls. Worked closely with developers to identify areas and methods to improve testing efficiency, expand coverage and increase product reliability. Developed Technical implementation strategies for K-12 School Districts and small businesses. Conducted extensive auditing and requirements gathering to design and develop strategy for IT needs. Created schedule for implementation efforts, wrote specifications for hardware and software purchases, developed integration strategy for hardware, operating system software, and application software. Provided services to consolidate and improve data for Student Information Systems. Developed and implemented data strategies for Federal "No Child Left Behind" Program. Monitored and oversaw appropriate implementation of services. Provided technical support to staff. Train and mentored Helpdesk personnel. Using Silktest developed and implemented automated testing for development organizations. Conducted QA and automation training seminars. Assisted in development of Automation strategies. Deployed over 700 Desktop computers and 6 associated Servers to support over 1100 users. Provided overall leadership and direction for technology implementation in K-12 school district. Developed and managed all aspects of technology delivery for School and Town offices. Developed and implemented Active Directory solution, MS-SQLserver, and MS-Exchange. Implemented online HelpDesk System using open-source solutions. 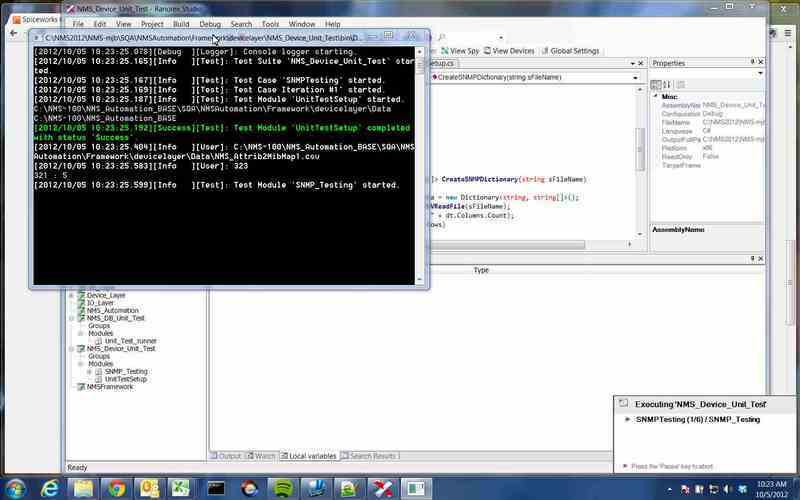 Using Silktest, developed frameworks, methods, functions and tests for Windows based MFC, C++ applications. Using Silktest created scripting scenarios to exercise web services in an apache, IIS environment. (before SilkPerformer). to create a load environment to validate client benchmarks for performance. K-12 Network Consultant Helpdesk and implementation services. Developed NT4 Domain model for multiple sites supporting K-12 Districts. Migrated to Active Directory with introduction of Windows 2000. Managed over 5000 desktops and over 250 servers across 16 locations. Renowned program established by WPI to service individuals and companies in growing management skills. Program covered all aspects of Management, Policy, Finance, Organization, Technology, Marketing, and Communications. Member: Blackstone/Millville Regional District School Committee (1985 to 2014) - 9 years as chairman. Member: Massachusetts Association of School Committees.